Today is not a special day for me. I came home, as usual she hugged me, said that she loves me and went to bed timely. I did some work and went to the restroom. When I opened the door I became just speechless – I saw so many write-up here and there …from floor to wall in small little boxes…some are wet even! I found one beautiful letter from among them – “Happy birthday ma! You are the best mother in this world and you are different! I am glad that I am your daughter. You are so lovable and full of talents. I love you more than me. Sometime I ask myself why? Why – I am not like you.”? Today I got 24-70 mm F2.8 lens as a gift from my friend. I have to be happy but I feel it is only an expensive instrument – anybody can get. But the shot I missed it will never come back. For me, it’s more expensive than anything else. It was a gloomy afternoon at Cox’sBazar. I have never seen how the cloud comes down to the sea and gradually covers it’s immensity. Little drops of rain was making me wet-I was in deep thought of myself. 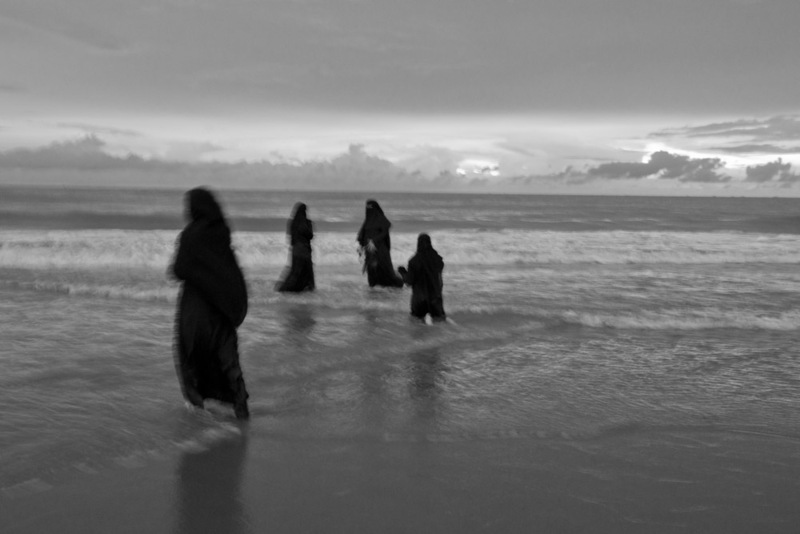 All of sudden I saw four black ‘burkah’ playing in the salty water. It seemed an unearthly event-seemed some cloud-angels came down to the sea from the sky with desire. Whenever I go to a new town I try to explore if there is a brothel. I love to walk in the area and chat with them as I think brothel is one of the places where I can see people without mask, exposed in their own ways. I have had a plan since long ago – I should work in a brothel as I have access to and do have some friends over there. I used to go there but I discovered that I didn’t like taking picture there. So, I return without taking picture and think I’ll release the shutter when I will come next time. 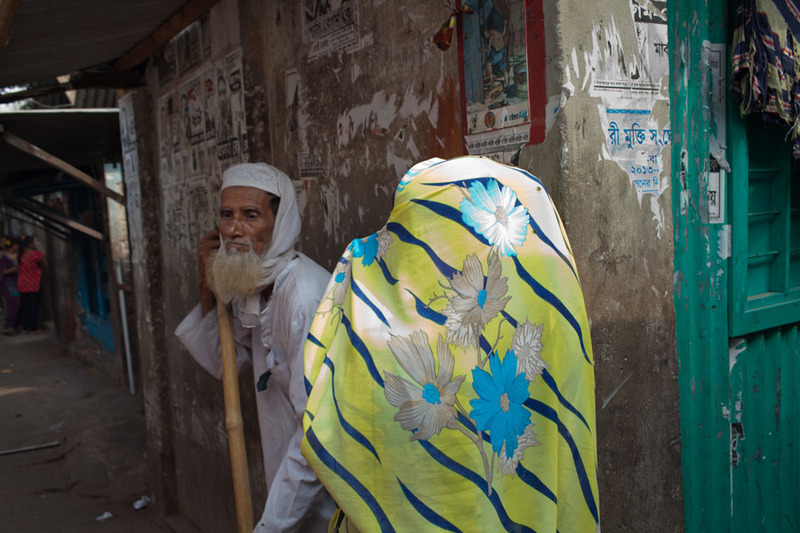 A few days ago I went to Tangail with Graciela Iturbide. 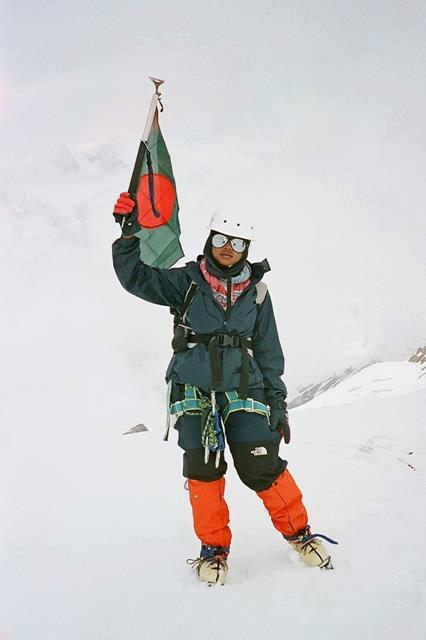 As usual I didn’t like to take picture, but eventually I took a few non-exposed images in which neither the girls did want to show their face nor did I.
Congratulations Nishat Majumder for becoming the first Bangladeshi woman to conquer mount Everest !!! 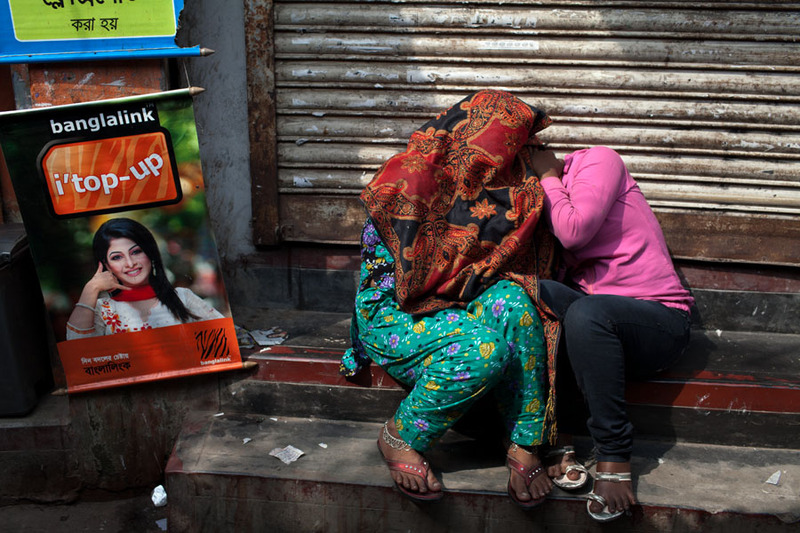 It’s 10:00 am at Sharat Gupta Lane in Old Dhaka. I was supposed to come at 11:00 am but I came earlier as I naturally do. My excitement and interest are albeit much. 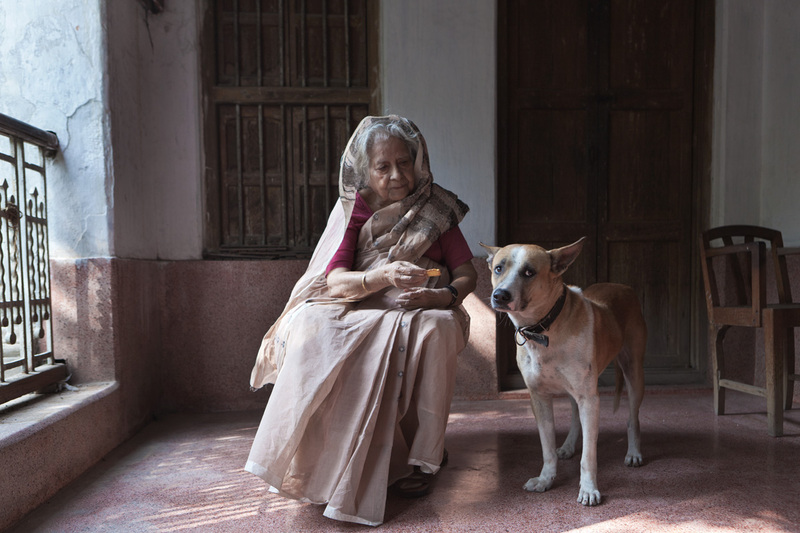 I’m going to see and take the photographs of Nurjahan Begum (85), a legendary female magazine editor in Bangladesh. Since my childhood I used to hear about her story and work, which I’m going to listen directly from her; this made me emotional. Despite she was sick, she gave me time. When I arrived in front of the 150 year-old house, it was amazingly attracting me. A very old man of about 80, who seemed to be representing the ancient time, opened the gate, and asked me, ‘ You are scheduled to come at 11:00 am.’ No sooner had he finished his words, the immense roar of the barking dog terrified my whole world. Managing my Camera, by no means, I seized the old man by the hand. Since his effort couldn’t ease me, Tomi (the dog of Nurjahan Begum) was held off. After five minutes Tomi had stopped, but I was yet dread. 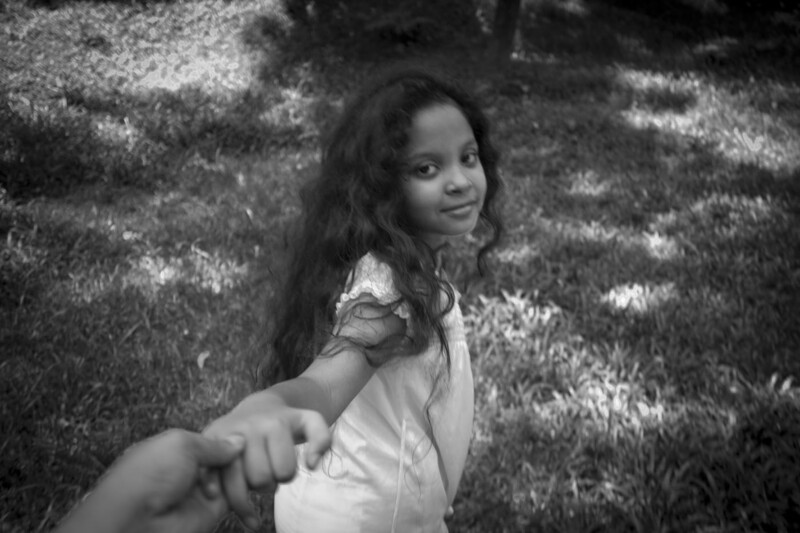 When I was almost at the end of my shooting, Nurjahan Begum expressed her interest to take picture with Tomi. Getting shrunk back from fear, I noticed that no effort was successful to bring Tomi to the verandah. Instead of his roar, taking all my fears and holding in him, Tomi was looking at me. Even his favorite biscuit couldn’t ease him. Getting feared from an unknown reason, he found escape as the remedy. I started taking pictures…click, click, felt so good and I laughed in happiness when I realized that I was the reason of his apprehension. Traditionally housemaid (helping hand) work for just two meals a day and assist the rich and middle-class housewives in Bangladesh. They don’t have fixed working-hour or salary. Such cheap labor is rare in the world, perhaps 15 dollars a month. 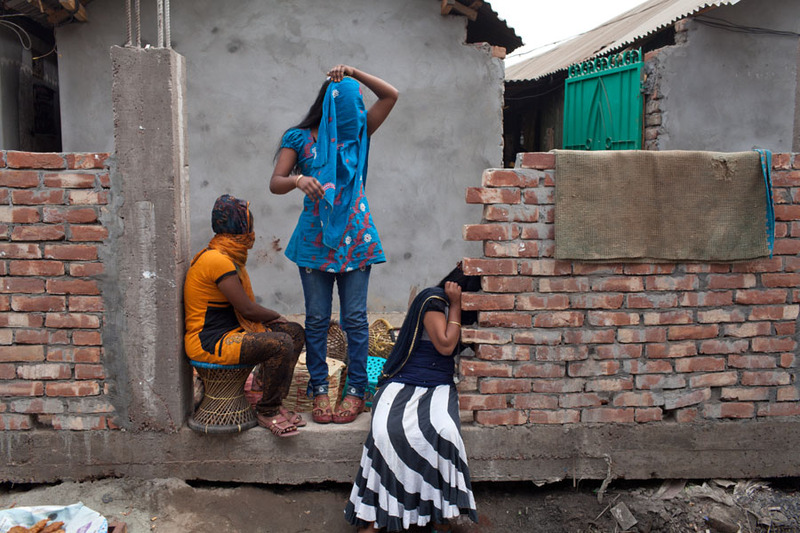 Since domestic work is gendered, hence, housemaids are women. In the society, it is perceived that only women will perform the domestic work which also includes housewives. This household activity is analogous for them although the ‘class’ creates a distance. Every day, maidservants take care of the bed and sofa with their hand but they are neither allowed to sit nor to sleep on them once. With their domestic roles, they are ‘close’ to the housewives and ‘distant’ at the same time. My intention is to document them by creating a rear occasion of keeping a close distance.